Day 1 of the £12k Golden Rod Final and I drew peg 66 on Speci. This was the middle section, so one of the fairest areas with no end pegs, which is a rarity at this place. It was a bit hairy driving around to the pegs as several cars got stuck in all the mud! We had to endure some lovely weather with strong winds hacking diagonally into our faces all day, too, which I’m getting used to now! I quickly worked out in practice that there were next to no carp feeding in the middle of the lake. Even the bream were short, so I never went more than 15 metres out all match. Close in and down the edges were the best places to catch. 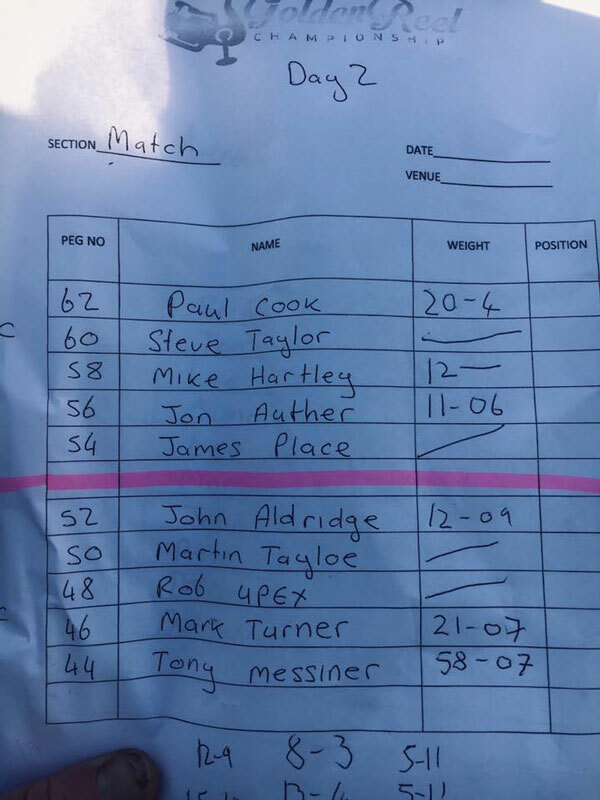 It worked OK as I ended up 3rd in the 10-man section with 62lb. 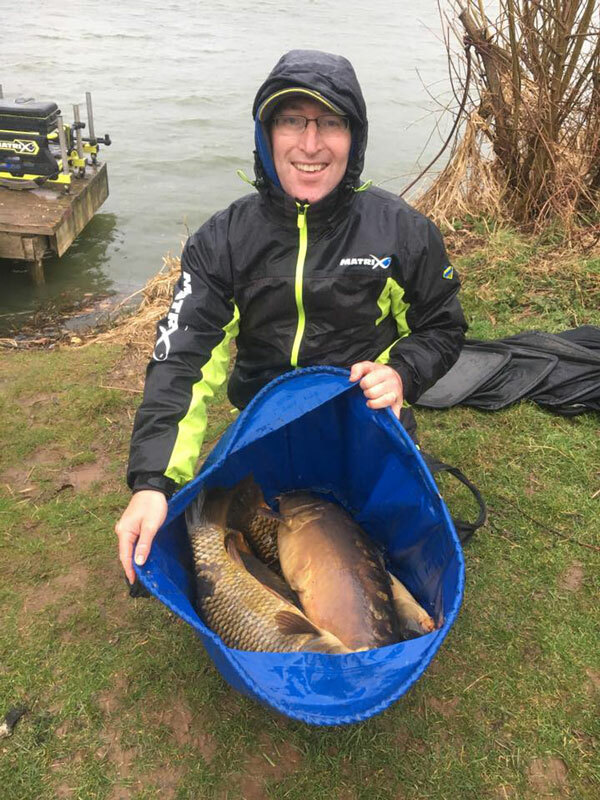 Matt Godfrey was 2nd on 70lb and Paul Cook 1st with 82lb. I was perhaps a bit unlucky not to get another point as my five big carp went 55lb on the scales, whereas Matt’s FOUR carp went 53lb – so it’s fair to say the big ‘uns had a chew! In hindsight I could have fished even closer in and that might have brought more skimmers, but I went a few metres further than my pre-match plan as my peg was set back a lot more than the two pegs to my right. Looking back I think that just put me into too much soft silt. I was still very happy with a top-3 going into the second day as you’re still well in the race, but with the likes of Steve Ringer, Nick Speed and Tommy Pickering all on section wins it was gonna be a tough one to win! Day 2 and the temperatures really plummeted with a slight frost in the morning. The whole venue completely switched off like you wouldn’t believe. I never saw a single fish topping while we set up, but none of us expected it to fish quite as hard as it did! 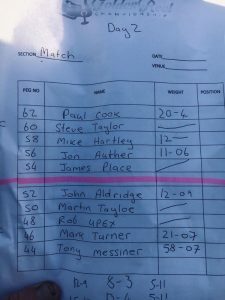 I was gutted to draw a very average peg 56 on an out of sorts Match Lake. In fact, there were 24 end pegs over two days and I somehow never drew one of them! It took an unbelievable four hours and 50 minutes to catch my first proper carp. Either side never caught any proper carp, so they were clearly not in an obliging mood. I had a few tiny F1s to add to my solitary carp and ended up with a massive 11lb, but that was par for the course and there were lots of DNWs on our bank. The two end pegs won our Burr Bank and just 43lb was needed to win our section, from the end peg on the opposite bank. A really anticlimactic end to an event I was really fired up for. Tacticswise I used my favourite Matrix Sim XS 3.3m (10ft 10in) rods both days and caught almost everything on a 26g Alloy Method Feeder with a yellow Dynamite Washter on 0.20mm Power Micron to a size 16 Carp Riggers. 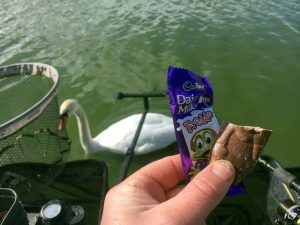 I felt I had a good solid plan IF it fished, but on the second day I should have gone ultra negative and just fished a tiny groundbait feeder with dead maggots or expanders, fishing for anything that swims. Maybe swapping to a more positive attack down the edges in the last 45 minutes. The thing is, though, everyone else around me tried everything they could think of too, and nothing worked. With a chilly wind in our faces all day I’m convinced the bulk of the fish were sat off the back of the wind on the other bank, which is where all the better weights were. A big well done to Steve Ringer on a well deserved win. Also a big thanks to Phil Briscoe for creating such a great event. It was very well organised with a nice and friendly atmosphere, despite the tough conditions. Looking back I don’t think I stood a chance off my draws and certainly don’t think anyone else would have framed off them. We certainly saw the best and worst of Larford over two very different days. However, I thoroughly enjoyed the experience and would love to get back in the Final for another shot. Golden Rod Final Here We Come!